A limited space in which machines make up their own world, that we can observe and analyse, but not influence; whose systems we hear, see and feel, but do not understand. A world to which we are exposed. Together, choreographer Christine Gaigg, composer Bernhard Lang, computer musician Winfried Ritsch, and light designer and stage designer Philipp Harnoncourt create a cross-genre art work specially for the Helmut List Hall for the opening of steirischer herbst, whose individual elements are connected by invisible threads: the shop, the machines and the people become a meta-machine whose rules determine the processes. 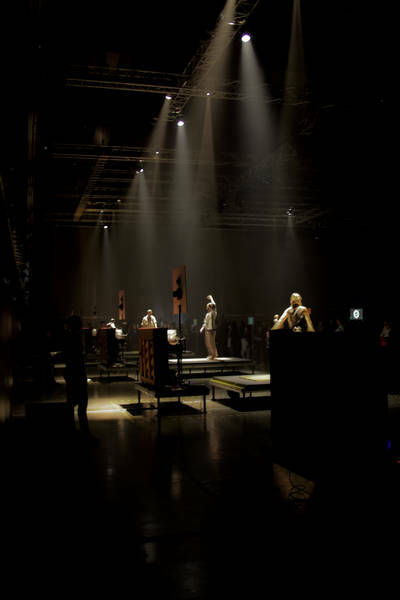 At twelve stations, arranged in series and each consisting of an acoustic panel and an automaton piano, twelve dancers perform in a feedback situation of movement and self-generating sounds. The result is indirect music: the steps on the acoustic panel are translated by a computer and transferred to the keys of the automaton piano, then played back and reinterpreted with human possibilities. In the repetition, the movements formed from the sound material change: new rhythms arise and challenge the dancers’ creativity and precision. The twelve units correspond to each other, at times soloistic, at others choral, synchronous or contrapuntal – but always unpredictable in sequence and spatial distribution. The machine pianos have an inherent technical virtuosity of which a human player would be incapable; the dancers then transform – equally masterfully – the machine-generated rhythms into complex, wild-flung or gently suggested adventures in movement. The juxta¬position and co-operation of man and machine is venturesome and full of friction.